History: More about The Morses, movies, and our transition to statehood. The story of Chimney Rock and Lake Lure cannot be told without recounting the life of one man—Dr. Lucius B. Morse—who demonstrated what uncompromising vision and foresight can accomplish. The rugged beauty of Chimney Rock and the surrounding area so captivated him that it shaped the rest of his life and those of his older twin brothers, Hiram and Asahel. The land that comprises the Park and the dreams of the Morse family are still entwined today, more than 100 years after Lucius B. Morse first glimpsed the magnificent Rock. Born in 1871 in Missouri, Dr. Morse was a practicing physician when he was diagnosed with tuberculosis. Advised to seek a more healthful climate, he made his way to the thermal belt of Western North Carolina. He loved to wander the area, often riding horseback down to Chimney Rock to view the giant monolith towering over the ten-mile gorge. It so intrigued him that he paid a man 25 cents to take him by donkey to the top. Surrounded by panoramic vistas, he conceived his dream here, not only of the Park but of the development of Lake Lure and the town of the same name. At the time, Jerome B. “Rome” Freeman owned Chimney Rock, having purchased it and the surrounding 400 acres from a speculation company for $25.00 around 1890. It was Freeman who first thought of making a trail to the base and erecting a stairway to the top of the Rock and opening it to the public. In 1902, with the financial backing of his brothers, Morse paid Freeman $5,000 for 64 acres of Chimney Rock Mountain, including the Chimney and cliffs. Many small tracts purchased over the years expanded the Park to nearly 1000 acres. In those days, tourists arrived on horseback or in carriages from the railroad stations of Hendersonville and Rutherfordton. Dr. Morse and his brothers built a bridge across the Rocky Broad River and started a three-mile narrow dirt road up to the base of the Chimney. Dedicated on July 4, 1916, the bridge was soon swept away by Hurricane Hilda and the great flood of 1916. Not to be deterred, they rebuilt the bridge and added a stone gatehouse two-thirds of the way up the road with a gatekeeper’s lodge beside it (still on the road up the mountain). That bridge stood strong until March 1984, when a new steel bridge replaced the old structure. Guilford Nanney, a local man with inventiveness and skill, was responsible for the first trail (the Cliff trail) and for the complicated series of stairways that lead from the parking lot around Pulpit Rock and the Rock Pile up to the top of the Chimney. This was the beginning of the modern improvements, vantage points and trail system to Hickory Nut Falls that exist in the Park today. As time passed, visitors did not relish walking the hundreds of stairs on the trail from the parking area to the summit of the Chimney. In 1946, plans were drawn for an elevator to transport people to the top. Blasted out of the solid granite cliff, a 198-foot tunnel led into the mountain to the 258-foot elevator shaft. A massive piece of construction, it took eight tons of dynamite and 18 months to complete. The elevator was opened to the public in 1949, the same year the entrance parking lot, three-mile drive and upper parking lot were paved. Next, the Sky Lounge, a gift shop and snack bar, was built on top of the elevator. In the spring of 1963, a Jeep trail was added to the base of Hickory Nut Falls, ending just a few feet from the 404-foot drop. Jeeps were discontinued due to the energy crisis in 1977, and the trail became known as the Forest Stroll walking trail. During the 1970s and 80s, Lucius B. Morse III and Todd B. Morse (Hiram Morse’s grandson and great-grandson) became actively involved as the directors of the Park. They focused on improvements to make the grounds and trails safer and more convenient. They replaced bridges and stairs, improved trails, added scenic view points and refurbished the buildings and elevator. In 1981, they created the five-acre Meadows to meet the needs of large groups visiting the Park. One of the most dramatic rebuildings during this time period occurred after the Sky Lounge burned to the ground on Labor Day weekend in 1981. Helicopters were used to transport trusses and other building supplies to the work crews at the top of the cliffside building site, and the new Sky Lounge was ready for Park visitors in June of 1982. In addition to making the Park safer and more convenient, the Morses placed an even greater emphasis on the preservation of plants and wildlife in Hickory Nut Gorge. 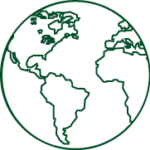 In 1978, two University of North Carolina at Charlotte professors had surveyed the Park and discovered an astonishing diversity of plants and many unique geological features. Based on that initial study, the Park opened its gates to botany, geology and other natural science students and professors. Through the work of these scholars, educational trail guides were developed, and many rare and endangered plant and animal species were identified within the Park’s nearly 1,000 acres. Chimney Rock Park hired a botanist in 1986 and an ornithologist in 1989 to supplement the work of the students and professors and to provide guided walks and educational presentations. In 1987, a Nature Center opened at the top of Chimney Rock road in a small, old stone building that had previously been used for storage and Park maintenance. The Nature Center presented information about the plants and wildlife of the Park and housed exhibits about the Park’s development. In 1992, a new, larger Nature Center opened at the Meadows to provide visitors with a better understanding of the Park. 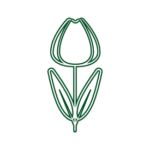 Developed by then-Park Naturalist Elisabeth Feil, it offered guests an introduction to the history, botany, geology and other special aspects that make the Park a truly natural attraction. A year-round schedule was adopted in 1992, and since that time, visitors have been treated to the wintertime beauty of the Park. In the spring of that same year, Todd B. Morse, who had been manager for a short stint in the mid-80s, returned to assume the role of president and general manager of the Park. While the family has always nurtured the property, Todd became the first member of the Morse family to manage the Park full-time since Dr. Morse. In 2004, the Hickory Nut Gorge Partnership was formed by Foothills Conservancy of North Carolina, Carolina Mountain Lands Conservancy, and The Nature Conservancy to work with the Friends of Hickory Nut Gorge, NC State Parks and elected officials to secure support for a new state park to help permanently protect the rich biodiversity of the scenic Hickory Nut Gorge. Thanks to the leadership of then-Senator Walter Dalton, the N.C. General Assembly authorized the new Hickory Nut Gorge State Park in the summer of 2005. In 2006, the new park was launched with the acquisition of the dramatic 1,568-acre landscape known as World’s Edge to the south of Chimney Rock. Featuring a mile-long stretch of steep slopes and rocky balds along the Blue Ridge Escarpment, it includes more than 20,000 feet of streams and waterfalls. Numerous rare plants and animal species can be found throughout the property due to its rich biodiversity. Carolina Mountain Lands Conservancy worked in partnership with The Nature Conservancy to borrow funds to purchase this property for $16 million in late 2005. They raised money from state and federal natural resource trust funds, and local citizens and in 2006 transferred the land to North Carolina State Parks. The Hickory Nut Gorge Partnership then quickly turned its attention to privately-owned Chimney Rock Park after learning that the owners, the Morse family, were interested in selling and protecting the park. Working with legislative leaders and then-Governor Mike Easley, the partners secured a $15 million special appropriation in 2006 to help buy Chimney Rock Park. Then, with additional assistance from The Conservation Fund, NC State Parks purchased the 996-acre park in 2007 for $24 million. Funding included a $2.35 million gift from Fred and Alice Stanback, and grants from the state’s Clean Water and Natural Heritage Trust Funds. With Chimney Rock as its focal point, Hickory Nut Gorge State Park’s name was changed to Chimney Rock State Park. The park continued to grow in 2007 and 2008 when Foothills Conservancy borrowed funds to acquire 330 acres along the ridge, summit and slopes of Cane Creek Mountain from conservationists Bob and Anne Washburn and John and Alan Moore. Adjoining World’s Edge, the land offers outstanding views of Chimney Rock and shelters the federally-endangered White Irisette and other rare plants and animals. NC Parks & Recreation and Natural Heritage Trust Fund grants funded the $6.5 million needed to add these lands to the new park. The park continued to grow with The Nature Conservancy’s transfer of land that it has long-owned and stewarded on Blue Rock Mountain, Round Top Mountain, Shumont Mountain and Rumbling Bald Mountain. In 2008, the Rumbling Bald Access opened. This area is one of the most significant sites due to its large size, which supports a habitat mosaic of unusually high biodiversity. Trails meander through large boulder fields, scattered below towering rock faces, making this area an excellent source for hiking, bouldering and rock climbing. The Hickory Nut Gorge Partnership continues to work with NC State Parks to strategically protect additional lands with high biodiversity to expand Chimney Rock State Park. Engines roared. Tires squealed. Knuckles faded to white. The pungent smell of fuel hung thick in the air. It was 1956, and the Park became a race track. They called it the Chimney Rock Hillclimb, and it tore up the tortuous, nearly two-mile road with more than a hint of danger. Pitted against the clock, drivers ran point-to-point in as little as 110 seconds. Race fan Jennifer Francis recalls working the Climb as a girl with her mom, uncle and aunt, where they kept time, recorded scores and even put out a few fires on the Climb’s well-known hairpin curves. “These drivers all did other races, but this one was special,” she says. 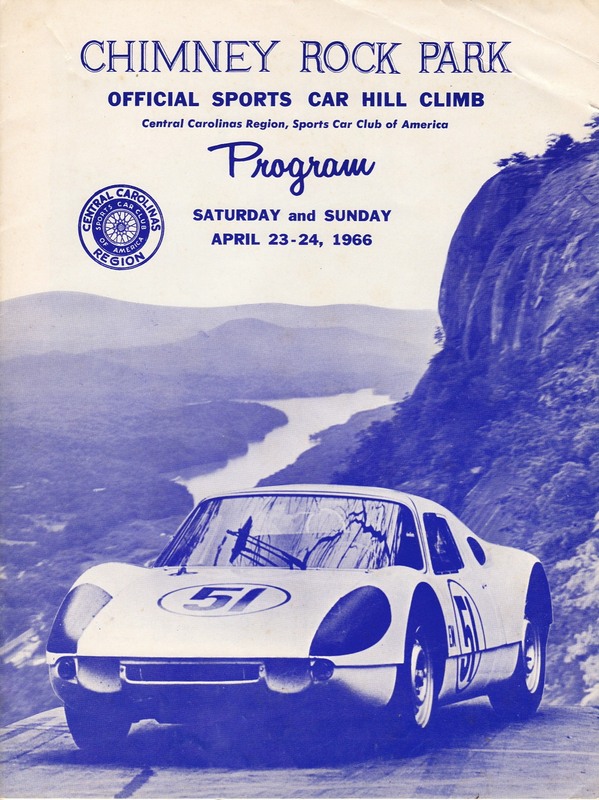 “Chimney Rock is beautiful, and it’s a lot more scenic than a race track.” Francis remembers the best part of the day was the final ride back down the mountain, when spectators could hop in with their favorite drivers and zip back to the starting line, flags flying from the winning cars. The Hillclimb endured for 50 runs. A shift of priorities and a growing Park brought the race to an end in 1995, but the exciting memories linger. The rugged beauty of Chimney Rock has long attracted celebrities and dignitaries, writers and photographers from near and far. The Park’s spectacular scenery caught Hollywood’s eye, too. Scenes from a number of movies have been filmed in the Park, including The Last of the Mohicans, Firestarter and A Breed Apart. 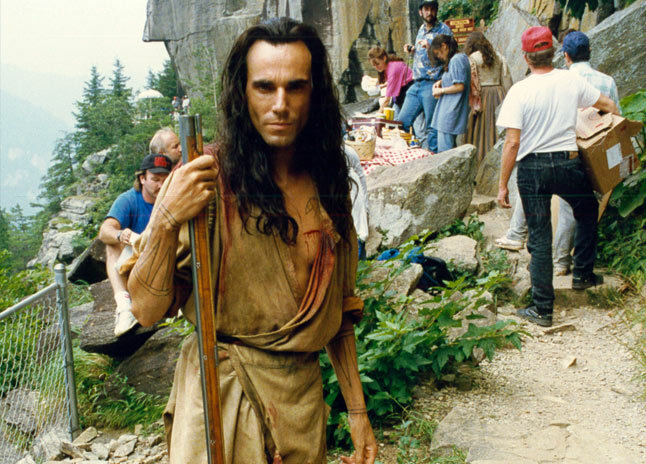 The Last of the Mohicans, the 1992 epic romantic adventure starring Daniel Day-Lewis and Madeleine Stowe, features some of the Park’s best assets. The last 17 minutes of the movie were filmed in the Park, including the climactic fight scene at the top of Hickory Nut Falls. Firestarter, the 1984 thriller starring Drew Barrymore and George C. Scott, was based on the book written by Stephen King about a young girl’s ability to start fires with telekinetic powers. The Park’s front entrance gate and bridge were featured in the film. A Breed Apart, the 1984 drama starring Kathleen Turner, Rutger Hauer and Powers Boothe, tells the story of a mysterious recluse who is dedicated to saving a pair of nesting eagles believed to be the last of a dying breed. Chimney Rock’s wooded areas and trails were the perfect setting for the outdoor scenes of the movie. Exclamation Point was the site of the eagle’s eyrie. And just a mile down the road from the Park at Lake Lure, Baby (Jennifer Grey) and Johnny (Patrick Swayze) had the time of their lives while filming the 1987 romantic blockbuster Dirty Dancing.